Strollers are an item that you will likely be using almost every day for many years, so it’s important that you choose a good, solid stroller that fits you and your baby’s needs. Remember that as your child grows, his or her needs may change. Here are some things you should consider when you are reading stroller reviews on this site to help you on your hunt for the perfect stroller to take your baby around town in. Your lifestyle is the first and foremost thing to consider when you are searching for a stroller. For example, if you are a parent that relies on public transportation to get around, you’ll likely want to choose a stroller that is lightweight, smaller in size, and portable. If you often walk around with your baby, a stroller that is sturdy, easy to maneuver, and has good suspension will be high up on your list. Finally, if you mostly get around with a vehicle, you’ll want to consider a smaller, compact stroller that can easily fit away in the trunk. Your child’s age is another very important factor to keep in mind while reading stroller reviews. Some strollers are only meant for certain ages: for example, jogging strollers are recommended only for children six months old and up. Weight & Size of the stroller is something to consider. How much weight are you comfortable carrying up and down stairs? Remember that it isn’t safe trying to lug a heavy stroller with your baby up or down stairs. Also, consider how much room you have to store the stroller in your vehicle, and whether or not it will fit comfortably through the doors and rooms of your house or other places you might take it. Your budget is an important factor to consider when reading stroller reviews. While it’s important that you don’t skimp out when buying a stroller, you don’t have to break the bank when buying one, either. We’d recommend thinking about the type of stroller you want, the features you’d like in one, and then go from there. Remember that a stroller is potentially an item that your baby will be using for years, so it might save you money in the long run if you purchase one that is proven to be strong and have a quality build. Portability is something important, too. Usually, it’s hard to find one single stroller that will fit all of your needs, and generally many parents will own two strollers: a full-sized one for day to day travel, and a smaller, compact model that can fit in smaller spaces. If you wish to buy only one stroller, we’d recommend opting for a model that is smaller and easy to transport. There are several different types of strollers, and it may be confusing to decide on which is the best type for you. Here is a basic overview of the different types, so you can get a better idea of what’s available. Standard strollers are the most common and popular strollers you’ll find these days. 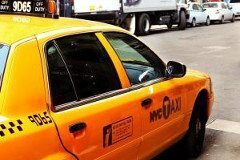 They cover a wide range of styles and needs, and can be found with a variety of different comfort options and features. Standard strollers are often the best choice for newborns, especially when they feature a reclining seat, shock absorbing suspension, and smooth-riding wheels. If you look around, you’ll find that many standard strollers are convertible, so you can use them as both a carriage and stroller, letting you get more use out of them as your baby grows. Suitable for newborns if it has a reclining seat. Include a wide range of features and options. They obviously aren’t optimal for purposes that the more specialized types of strollers cover. Age Range: Newborns may use a stroller if it reclines. Otherwise, they are appropriate for 4 months and older. 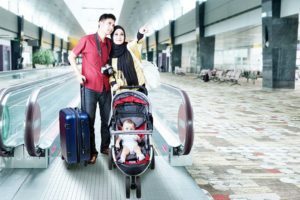 Travel Systems are a convenient innovation that combines both a car seat and a stroller, giving you the versatility to use it in either way. Travel system strollers can be used from the time your baby is an infant, all the way through toddler stage. The car seat portion keeps your baby in a comfortable reclined position, while protecting the neck, head, and back. 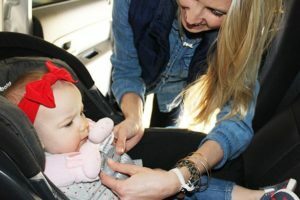 A feature that a lot of parents find very convenient is the ability to use the car seat portion as a carrier, which gives you the option of transporting your baby from the stroller to the vehicle without waking them. These dual-purpose units give you a lot of bang for your buck due to their versatility and the amount of time you can use them. Offers some protection from the elements when you are out and about with your child. Allows you to transport your baby from the car to the walker or vice-versa without waking them. Generally the bulkiest type of stroller, which can sometimes be a pain. You are stuck with using the car seat and stroller contained in the unit; you can’t mix and match them. Age Range: Newborn to toddler. Jogging Strollers are great for the active parent that wants to take their baby out while they get some exercise. Although jogging strollers used to be a lot more expensive, they’ve come down in price over the years, making them affordable for almost any budget. Can be used on almost all terrain. Good for active parents that want to exercise with their child. Most jogging strollers are designed for children six months of age and older. Some reports suggest that the 3-wheel design of jogging strollers is less stable than the standard 4-wheel design, especially when going over curbs. Age Range: Recommended for 6 months and older through toddler years. 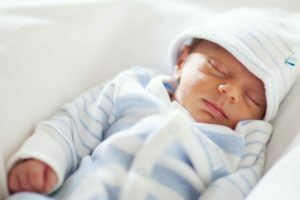 Great informative post about strollers! The 5 factors you brought up in the article are extremely valuable tips for stroller shopping. Another thing I found useful while selecting a stroller is thinking ahead of time and trying to figure out how many kids the stroller will eventually accommodate. 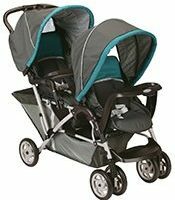 The reason for this is that there are strollers out there that are versatile, and can accommodate 1, 2 or 3 kids at one time. Such strollers make things a lot more convenient since you’ll only need 1 as opposed to 2/3 strollers in the near future.